These items are contained in Volume 3 of the Wyandotte County newspaper clippings. 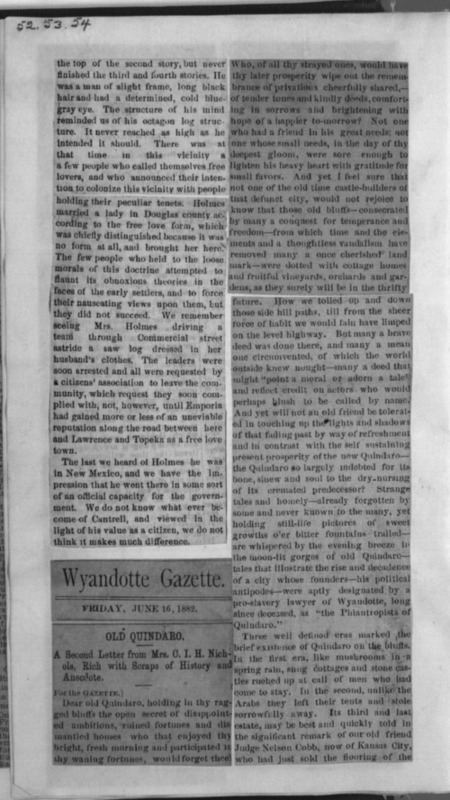 Clarina Nichols wrote letters to the Wyandotte Gazette in which she reminiscensed about Quindaro, an early Wyandotte County town. There are three different publication dates. The first letter, published on June 16, 1882, is dated June 6, 1882, but the newspaper indicates this is the second letter. The other two selections are not dated though the newspaper publication date is. The letters are written in a highly literary style. The one published June 16 describes parts of the town of Quindaro. The next clipping describes some prohibition efforts. The last one identifies a cabin as part of the underground railroad and Nichols also describes her personal assistance to a fleeing slave named Caroline. Mrs. Nichols was living in Pomo, California in 1882. Funds for digitizing this item were provided by Marilyn S. Blackwell and Kristen T. Oertel, authors of Frontier Feminist: Clarina Howard Nichols and the Politics of Motherhood. The publication was the winner of the Coalition for Western Women's History Armitage Jameson prize.